Ebook versions of the complete and unabridged AutoFlick are available at Smashwords through the end of July 2017. I hope you get a chance to download one. Reviews are hugely appreciated. On a date with Juliana, Izzy first stops by his last Boy Scout meeting. Afterword, they half-heartedly pursue a 1957 Chevrolet Bel Air. We pulled up at a four-way stop sign, and a ’57 Chevy Bel Air arriving at almost the same time paused only briefly and then shot across our bow through the intersection. There were teenagers inside and they were smoking. “Follow that car, please,” I said. The people in my life were getting used to this, and Juliana didn’t even blink. We turned to follow the Chevy, a heavy, boxy carriage with modestly long skirts and an abrupt windshield that wrapped slightly around the sides of the front cabin. Its distinctive forehead leaned slightly into the wind, and a flat, jet-plane hood ornament steered it streaking down the road ahead. 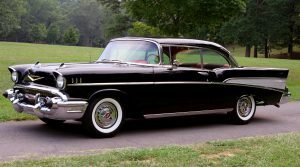 The ‘57 Bel Air was a popular car for teenagers, reliable and roomy and of an age that middle-class dads no longer saw as suitable for the family car. A passenger flicked his cigarette, a dramatic fling into a cornfield that may have sailed several rows deep. We followed the Bel Air a little ways, but our hearts were elsewhere. We gave up and headed down a dark farm lane tucked between a cornfield and a line of trees, where we worked on the merit badge in French kissing, an unexpectedly easy one to earn. Here it is, 9:52 PM on the Right Coast, and no diligent AutoFlicker has prompted me to update the chronology. Thanks a lot, dudes. 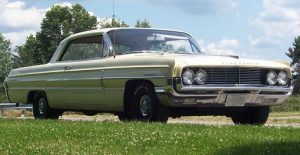 On July 5, 1968, Izzy and his mom track a 1959 Desoto Firedome with a Stassen bumper sticker. This is one of my favorite chapters. Can’t believe the Followers let me down. I was riding home from work with my mother, and in front of us was a 1959 Firedome, nephew to my father’s car, another winged experiment from the Ike fantasy world. Viewed from the rear, it hefted a barrage of thick chrome fittings and a large insignia that included a keyhole for the trunk. On either side, three protruding circular taillights were stacked on top of one another with a chrome V jutting over the top. It had two radio antennas, one on each side of the trunk, and a low, wide wrestler’s stance. This particular vessel had a bumper sticker that said: “Stassen ’68—Why Not?” The former governor of Minnesota was on his fourth campaign in pursuit of the Republican nomination for president. He had at that point in the summer of 1968 rounded up just one delegate, and there were only a few weeks until the party convention in Miami. After the RFK assassination, the Secret Service assigned an agent to guard him. It was said this protection was the biggest crowd Stassen had attracted so far in the campaign. A perpetual anachronism, Stassen would keep running, in 1980, 1984, 1988 and 1992, and you can judge for yourself whether his country would have been better off in any of those years with a liberal Republican president committed to peace. A 1962 Olds 88 passes at high speed and flicks a cigarette to the road. Speedy tries to catch up but loses him. Then he gets the idea of marking cars that have already been cited in the study of people who flick cigarettes from automobiles. In the National Geographic, the savannah science guys always shot the wildlife with tranquilizers before they stapled tags in their ears. I wondered if this is what my father had in mind. “It can’t be permanent—we don’t want to tamper with the evidence—and we may have to tag them without their knowing.” I was used to the fact that my father often thought out loud. “You mean put a mark on the car, right?” I said, trying to lead the witness. I should have stepped in there with something to change our bearing, but I came up empty. “I flick butts.” Speedy seemed pleased with this. “I guess that would show them,” I said.